March is here and today was absolutely beautiful out. 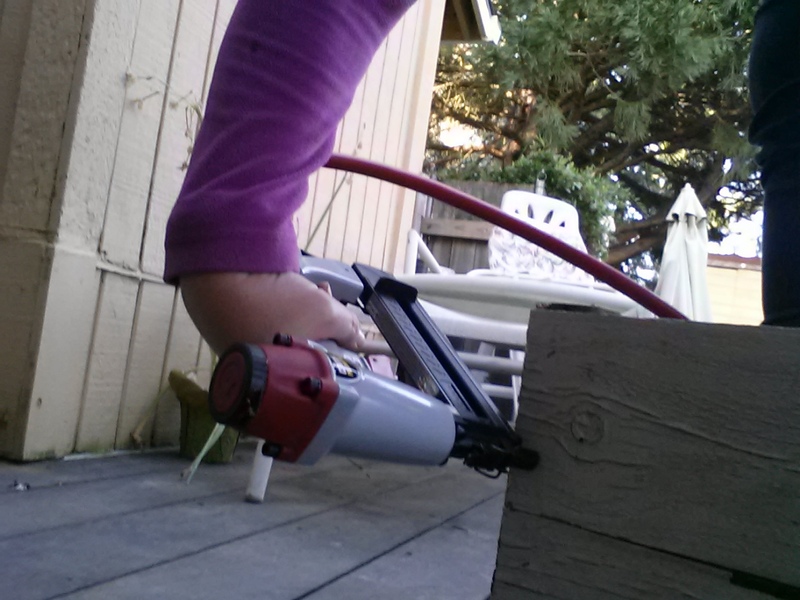 I so enjoyed going out and watering my little seedlings. Today I noticed that the brussels sprouts and kale had sprouted. 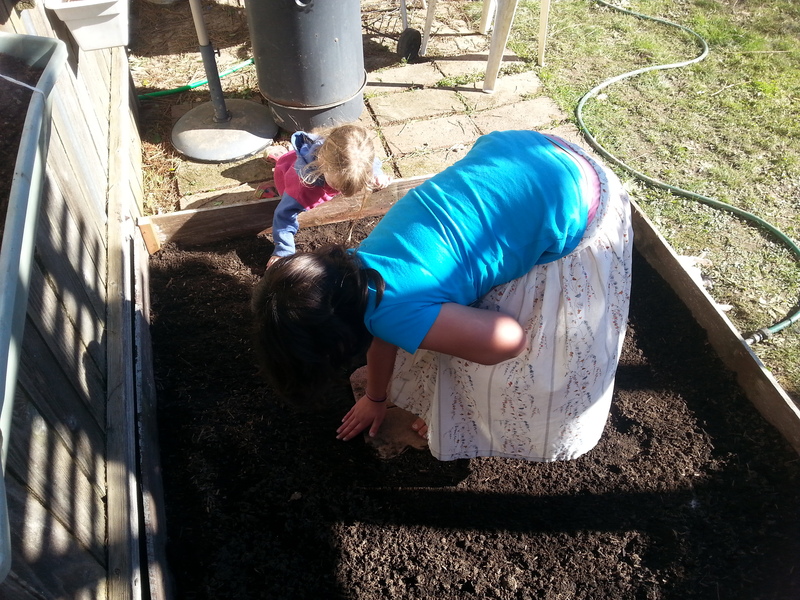 I figured it was high time to finally write a post about my little garden plot. 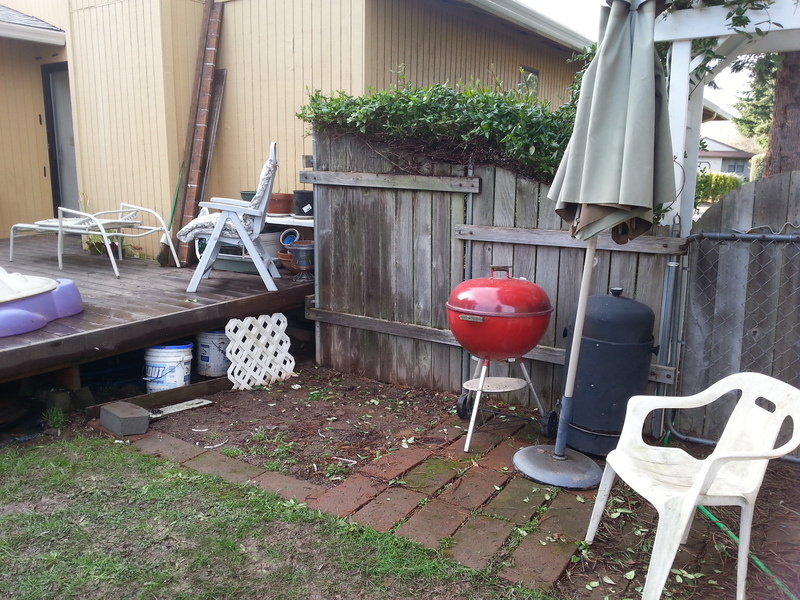 My father-in-law has his usual plans for the “big garden” and said that I could have a little space next to the back deck for a garden of my own. About a month ago, here’s what my little space looked like. 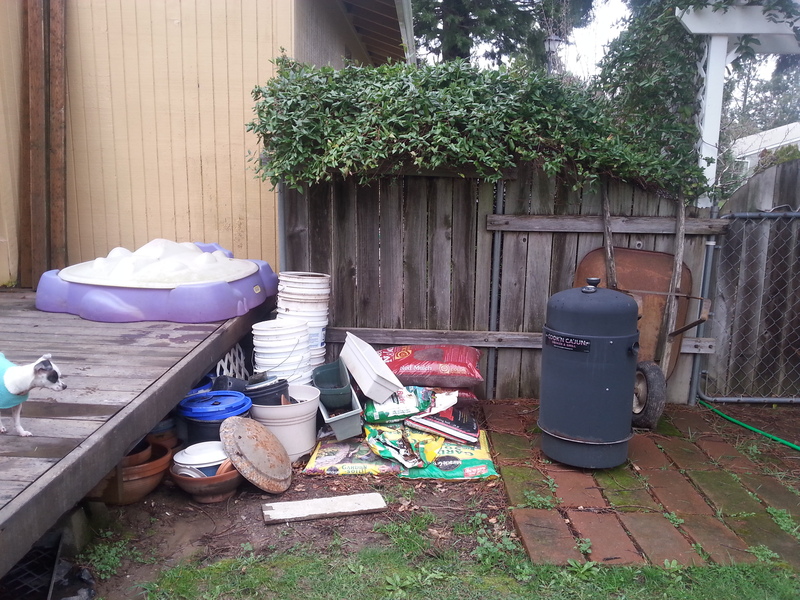 Yep, that area piled high with bags, buckets, and junk. I started cleaning it up with eagerness. I found the buckets a new home and gave the honeysuckle a haircut because I planned on hanging some containers on the fence. 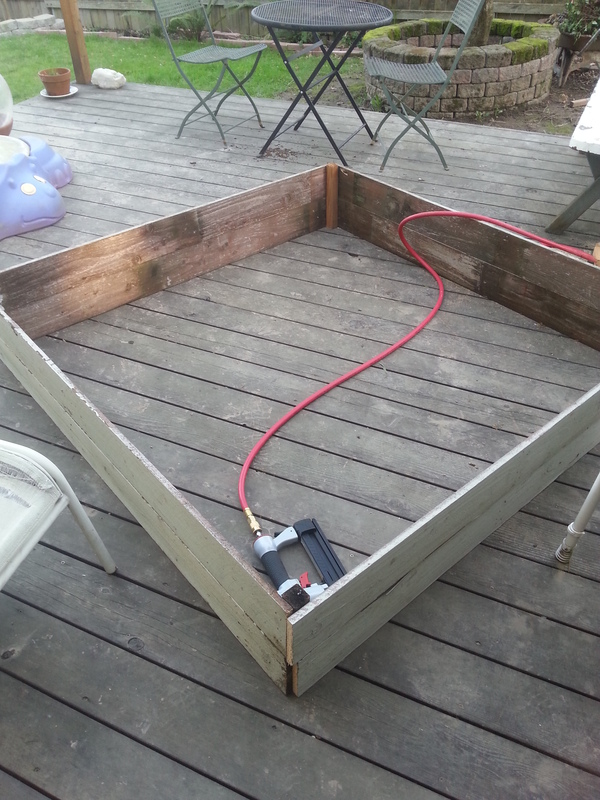 Then I used some of the fence wood I found on freecycle.org (which we also previously used for our chicken run) to construct a raised box for the garden bed. 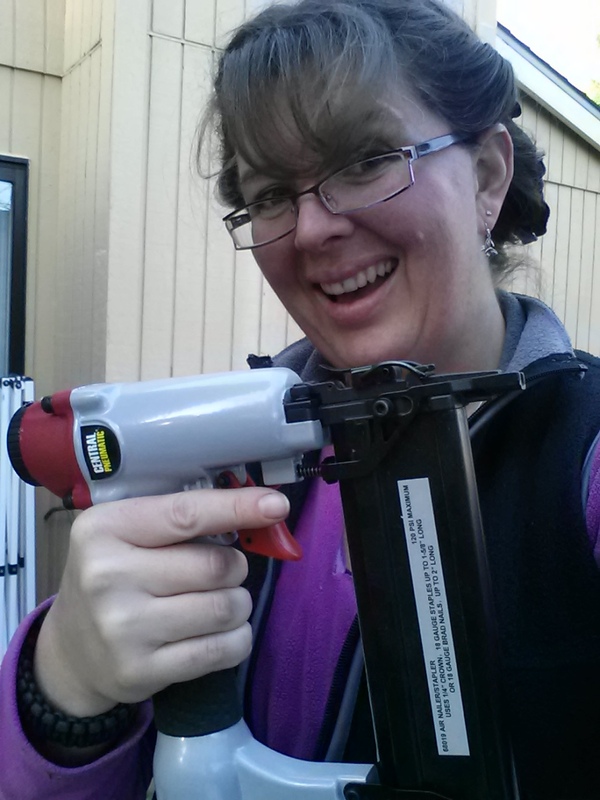 How did I ever do construction without pneumatic tools?! It was sooo easy. Bam, bam, bam and it’s done! The box ended up being 5 foot square. 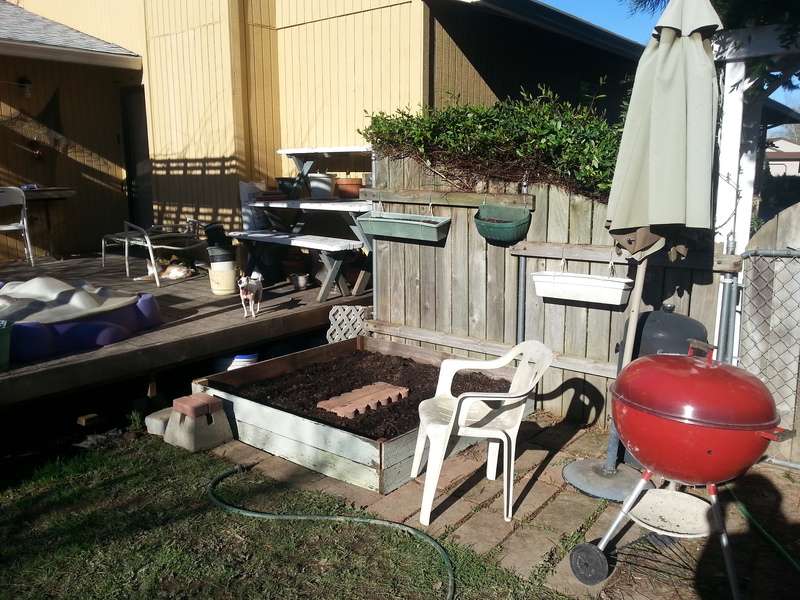 Twenty-five square feet of garden goodness. Not much when I’ve been used to at least 5 times that amount, but I’ll take whatever I can get. I also have grand plans for a bunch of containers. We’ll see how those turn out. I have never done container gardening before. 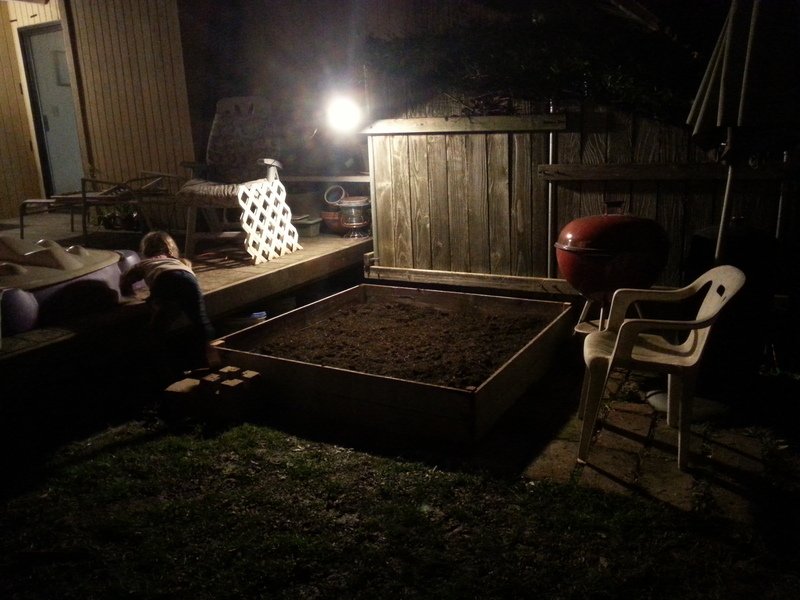 So, the evening I got the garden box built I ran out to the store and bought bags of garden soil to put in my box. I hated to spend that kind of money on it since I know there are far cheaper ways to obtain soil, but I was too impatient to figure it out. I was even too impatient to wait for the next day to empty the bags into the box. So I rigged up a light and worked into the dark. 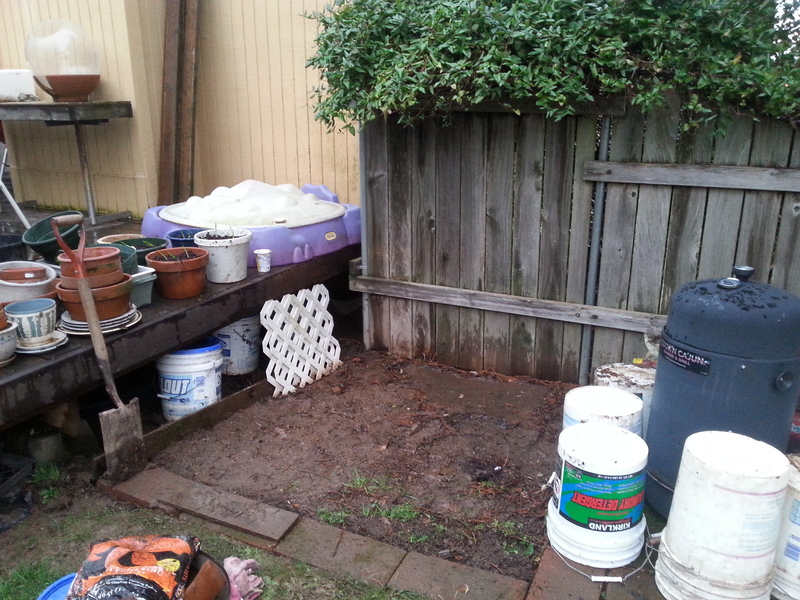 A nicely filled garden bed waiting for seeds. 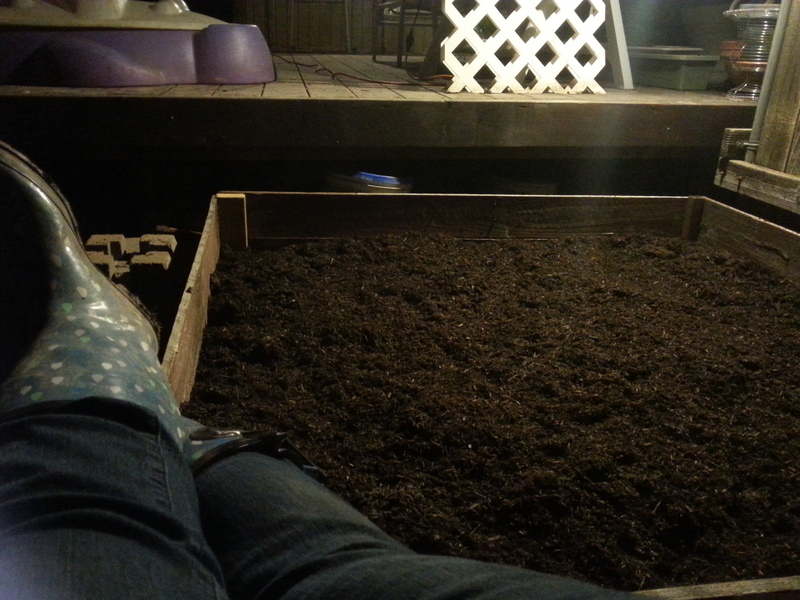 It was such a mild night out, that I was able to kick back and put my feet up for a little while and enjoy my endeavors. 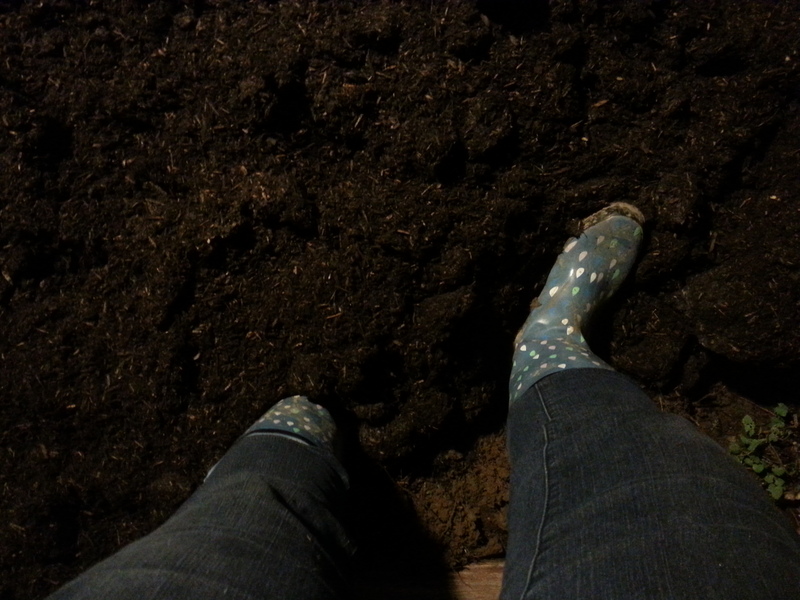 And speaking of feet…I am loving gardening in my rain boots. 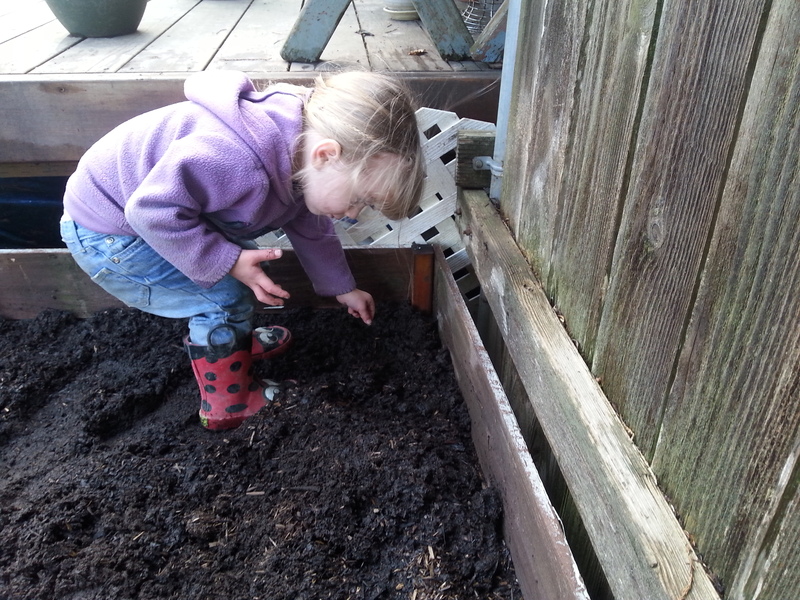 I loved that I didn’t have to worry about dirt getting into my shoes as I spread it around. I know this may seem like a no-brainer to you all, but I’ve never had good rain/much boots before. 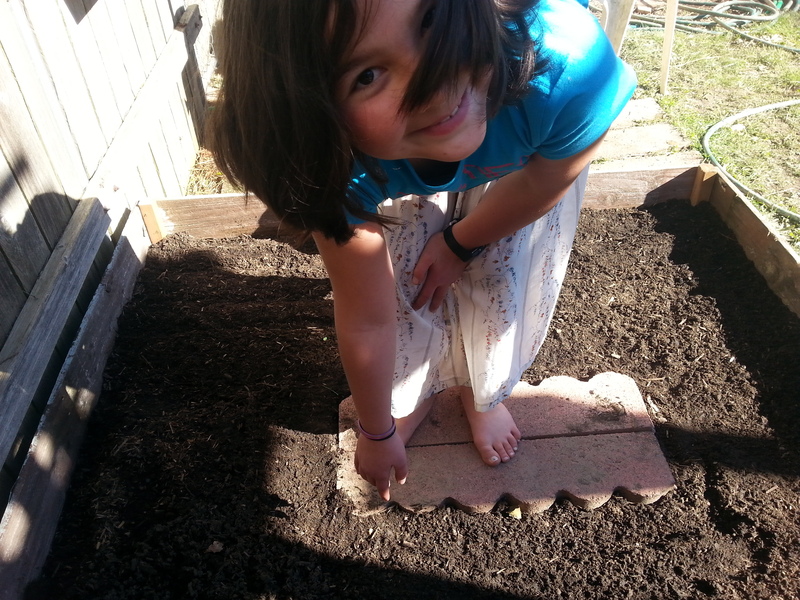 The very next day (February 17th) the girls and I got busy planting. Well, that’s enough for now. I have several more pictures about my garden, but it’s late and I’m tired. 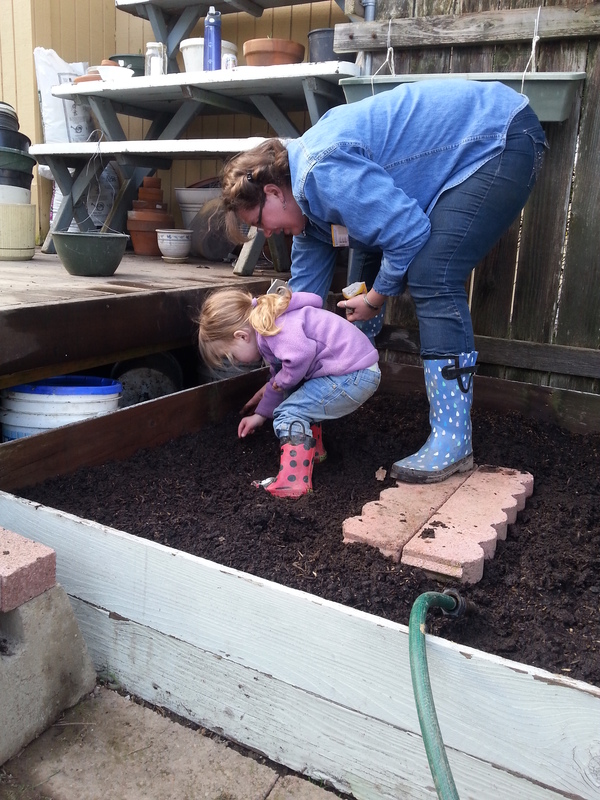 This entry was posted in Portland Interlude 2014-2016, Urban Farming and tagged Garden, Homestead Kids, Pacific Northwest Gardening, Recycle, Reduce, Reuse, Seasons, Urban Homesteading on March 1, 2015 by Maridy.